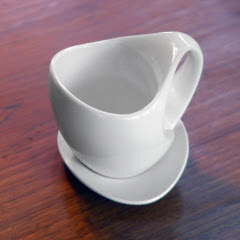 For the late nights in the studio, perhaps we should be drinking from the Ultimate Coffee cup. (but perhaps that is a good thing?). This is the ideal cup! Can it be ordered and sent internationally? I think what you say about the joining of the handle to the cup makes sense, but from a practical point of view, the way the hand is holding it in the lower right picture could be compromised, and thus not as functional. Form following function.